We ordered Royal Palm Turkey hatching eggs. I used a contact I had on Backyardchickens.com and they ended up coming from New York. It is recommended to start incubating eggs within 10 days of being laid. It did end up working out this way but only barely. Next time I will be more careful and order my eggs from a much closer location. It was really easy to build the incubator (especially for me because all I did was watch). The only thing that gave us trouble was that we didn’t hook up a fan at first. It turns out to be essential to get the heat to regulate properly. Once we had the heat steady at 100 we put the eggs in. I turned them 3 times a day. Then I finally got the broody hen I wanted. Our 2 year old Buff Orpington, Delta, started sitting in the main hen house and wouldn’t get off the nest. 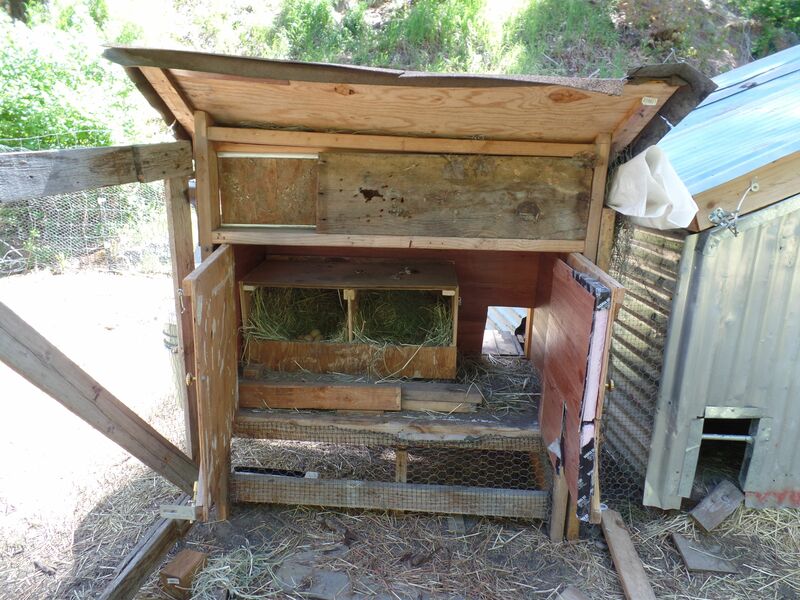 I moved her to the little broody house and yard we had set up earlier to keep her isolated. I locked her up for 24 hours or so but when I left the door on her house open so she could come and go she left and went back to her original spot. I moved her back again and just let her out for 20 minutes or so per day for a couple of days. When she went back on her own I left the door open so she could come and go as she pleased. A broody hen only gets off her nest briefly to eat and drink and poop and then she goes right back on. When she was doing that on her own for a few days I decided to give her the eggs from the incubator. 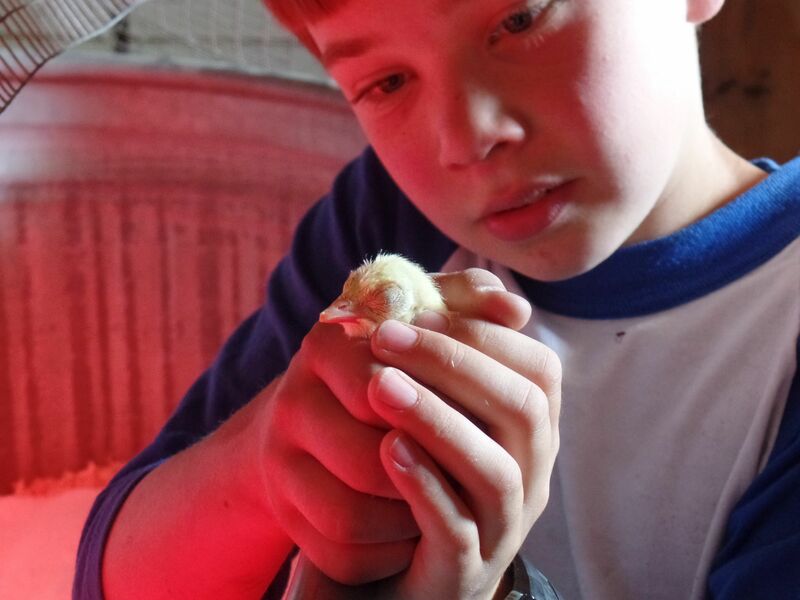 I had added chicken eggs to the incubator as well. I read somewhere that chicks encourage poults (baby turkeys) to eat and drink often. I decided to give Delta all the eggs because my incubator only had one light bulb and I was worried that I would wake up one morning and find the incubator had gone cold. 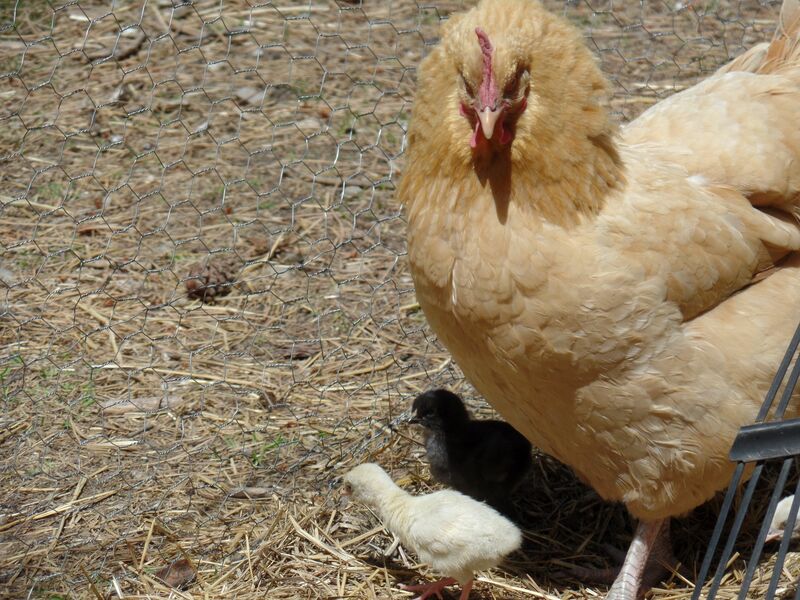 Delta had brooded a batch of chicks last year successfully and I felt she was more reliable. Oh, I forgot to mention, I gave Delta 12 duck eggs to sit on in the broody house. These eggs were from a duck nest I had found. I had tried to get the duck to use the broody house but that didn’t work at all. Anyway, Delta had been sitting on them and I candled them to see if they were alive or not. Each one of them was developing nicely and I couldn’t just throw them out so they went in the incubator. 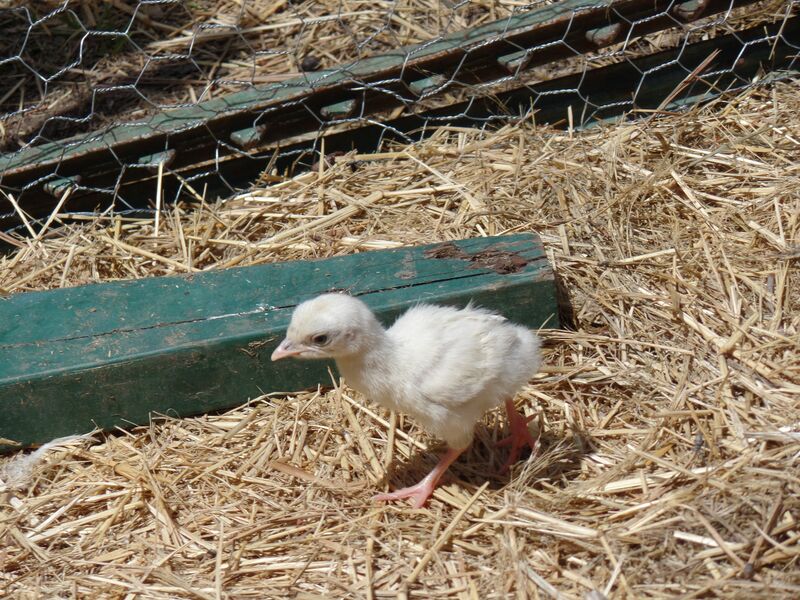 A couple of weeks later, on May 31st, I got a phone call from my friend that the turkeys were hatching. We ended up with four turkeys. 50% is a pretty good hatch rate. The next day Delta hatched out three turkeys. Also, a 50% hatch rate. One turkey had broken its shell all the way around but it was stuck on its little body and it couldn’t get free. I’ve heard you aren’t supposed to help a chick out of its shell but this looked like it hatched all right but the shell was just stuck to it because it was too dry. We decided to bring it up to the house and soak it off. That seemed to work out all right and we gave the little turkey a blow dry and put him back under Delta. 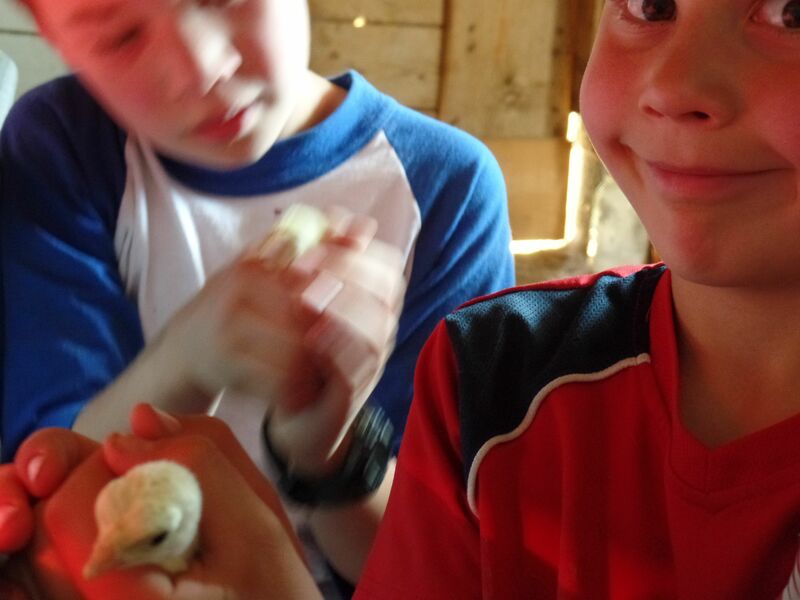 Delta also hatched three chickens. After a couple of days, Delta brought her babies outside for the first time. I went down in the morning to find her outside. I checked under her but only found one turkey. I looked around and found two poults laying on their backs just barely twitching on the ground. I scooped them up and put them in the incubator to see if they could be saved. It seemed they had fallen over and couldn’t get back up. They had gotten so cold and were close to death. After some time in the incubator, they both perked up so I moved them to a box with a light and food and water. One had a foot with curled in toes. The other seemed totally fine so I gave it back to Delta after I was sure it was eating and drinking well. I brought home the four turkeys from my friend’s house later that day and put them in the box with the crippled one. I feel so dumb experimenting with our relatively expensive turkeys. It was just because I didn’t want to do the extra work of raising them in a box. There is definitely more risk involved when you don’t control all of the factors. Aside | This entry was posted in Chickens, Happenings, Other Barnyard Birds. Bookmark the permalink.